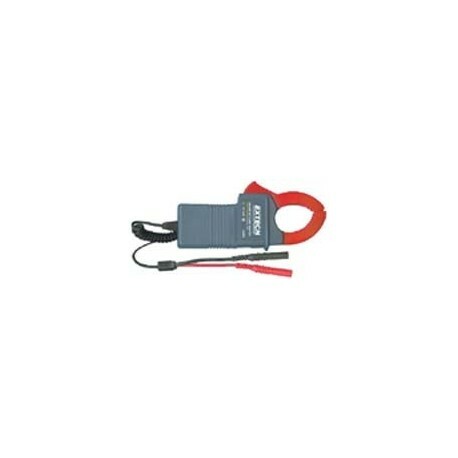 The 300A AC CLAMP-ON ADAPTOR multimeter has banana plugs that connect to COM and V sockets of any multimeter for clamp-on current measurements. It features a 1.2" (30 mm) clamp jaw opening and measures AC current and converts it to 1mV/count for reading current on any multimeter. At 1.5% basic accuracy, it measures 9.5"L x 3.6"W x 1.7"H (24.1 mm x 9.1 mm x 4.3 mm) and weighs only 10 oz (265 g). The 300A AC Clamp-On Adaptor comes complete with built-in 10' (3 m) cable with banana plugs and 9V battery.